I have been receiving a lot of e-mails and messages from people suggesting how I should go about finding Michaela. I know that these all come from people who care and want to help. Some of them, however, have been a bit upsetting. 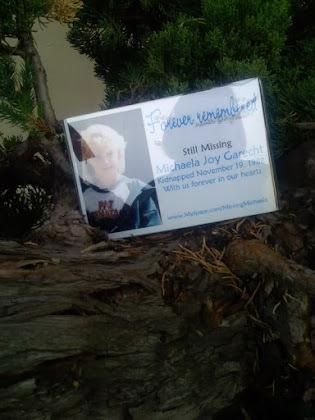 One person gleefully informed me that I was personally "missing the boat" in the search for Michaela because I wasn't going door to door to look for Michaela myself. Apparently she had found both a missing cat and a former fiance this way, so she thought it was the key to finding Michaela and I was negligent for missing it. 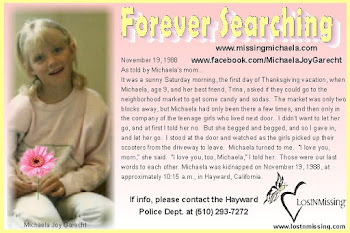 We just cannot approach the search for Michaela the way we did twenty years ago, when everything was fresh, when the people who lived in the neighborhood had lived there on the day Michaela was kidnapped and in the weeks, months, years before. 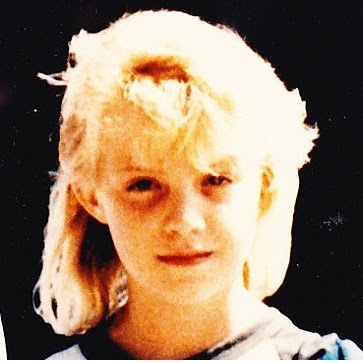 The eyewitness looked through photos of sexual predators in the neighborhood 20 years ago, when the predators in that neighborhood were the ones who lived there on the day Michaela was kidnapped. Those things wouldn't work now, of course. The people who live in the neighborhood today are a generation removed from Michaela's kidnapping. 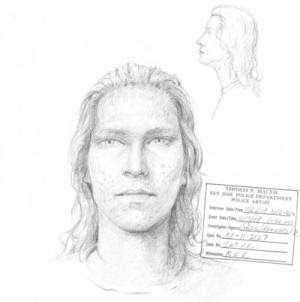 And if Michaela's kidnapper is on the Megan's Law list of sexual predators, he probably bears almost no resemblance to the man who kidnapped Michaela in 2009. I know this is a fact because I've seen updated Megan's Law photos of suspects and let me tell you, they are dumpy looking middle aged men now! And it is not only the time that has changed, but in the course of a week, a month, a year, much less over 20 years, the geographic area expands so far! But I guess the key point that everybody needs to know is that a very active, excellent investigation IS being carried on. It was being carried on even before Jaycee was found, and since then, with all the publicity, we have received so many leads that now there is extra manpower, from both our police department, and from the FBI, even the Cold Case division of the Alameda County District Attorney's office. 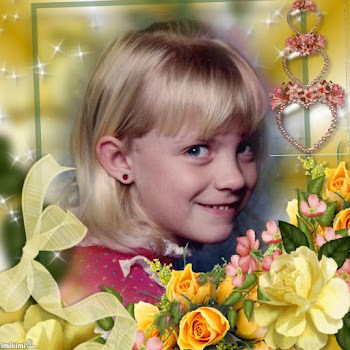 And I have to say with regard to the latter that we have an excellent investigator at the Hayward Police Department, and he has the best support possible within the department from other excellent people, and he had made certain that Michaela's case was NOT a cold case, even before Jaycee was found. He had pulled it out and set it in the sunshine and warmed it up with the most caring, compassionate, and intelligent attention a long-missing child could ever be blessed with. We are not without leads, and we are not without clues. Because of the passage of time and the expansion of the geographical area to be searched, we are far beyond going door to door, and we are far beyond sending out "missing" flyers. If the investigation narrowed down a specific area, we could target it, and that would be a good idea. Right now the only targeted area is in Antioch, right around the Garrido property, and believe me, those people are very aware of the investigation, very aware of Michaela, and those who haven't been interviewed already are on a list to be interviewed. I was out in Antioch most of the days of the search, and the people in that neighborhood were wonderful people. They were patient with the complete disruption of their lives. They were helpful to the investigators, not only willing to help by providing information, but willing to help by coming out and giving the searchers cold drinks and food. I've heard that some of them have received threatening letters from the public, because they are being blamed for the fact that they didn't turn Garrido in for harboring a kidnapped child, but this blame is misplaced. There may be other predators out there who were associated with Garrido, but those neighbors are horrified to find out what was going on in their neighborhood, and they are fully willing to help. Many people keep asking about age progressions also. 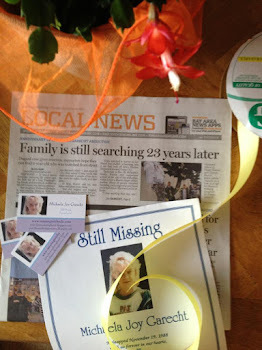 I have covered this subject in a previous blog, at http://thewonderingheart.blogspot.com/2009/09/age-progressions-of-michaela.html. Since we do not have, and have not had, an age progression that I thought looked at all accurate since the first one, which was done in 1994, we have not used them. I am working with the National Center for Missing and Exploited Children right now, trying to come up with an age progression that looks like it could be accurate, because they really want to do that, and there are television shows that really want one as well. But so far I'm just not convinced by the science behind it. We've had four or five age progressions done, and one thing I can say for certain is that none of them look anything like the others, which says something in itself. But for me, they don't appear to bear any "genetic" resemblance. Michaela has three full siblings, and the progressions don't look like them. The faces in the progression are "types" that I see and immediately they strike me as coming from a different "family," another place of origin. Meanwhile, the investigation DOES go on. In the end, it is in God's hands, I believe, and I can tell you that he has been shining a brilliant spotlight on Michaela within the last year. 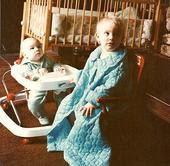 Even before Jaycee was kidnapped, suddenly I myself had started speaking on my spiritual journey, and on child safety. I wrote a book on child safety -- a rather odd thing to be doing over 20 years after my own daughter was kidnapped, right? But it was an absolute inspiration to do so. I'd had a myspace for years, but suddenly I decided to set up a "real" website for Michaela. Before Jaycee was found, America's Most Wanted had made arrangements to do an updated story on Michaela. And then, Jaycee was found, and everything exploded! Does it seem to be a coincidence that all these things started happening to put Michaela in an international spotlight almost immediately after I'd finished the website for Michaela? In the days and months after Michaela was kidnapped, we held many mailings, sending out flyers. But we didn't have the very best tool for searching for a missing child at that time, and that is the internet. In the last week, a story broke in the media about a man who had seen a girl who looked like Jaycee, ten months after her kidnapping, standing in a gas station staring at a missing flyer for Jaycee. You know, I think it probably was Jaycee, and this image just has to tug at your heart. After Michaela was kidnapped, the first time I left home I drove down the streets, and there was not a telephone pole that didn't have a missing flyer for Michaela on it. I was overwhelmed by the love of the community, and I hoped that Michaela was able to see it, was able to feel that love, and that it brought her strength. To imagine Jaycee standing there, looking at her flyer, being able to see and feel that love, knowing that her mother had set this in motion, that her mother was looking for her, but she was seemingly unable to respond to it. Well, it is heartbreaking. It is not an imposition, all these requests for interviews. It is deeply gratifying, because all these people who work for the media actually care about Michaela. Of course they do! Everybody does! But you will see, when you are talking to them, tears well up in their eyes. All this love for Michaela. But I didn't sleep. I didn't eat meals -- instead I tucked granola bars in my purse and lived on them. I missed a lot of work, and I don't have sick leave or vacation. And while it may be petty, my family will tell you that I do not allow my picture to be taken. My daughter, Libby, commented on this one day, when someone wanted one last thing that I was too exhausted to deliver. "You won't even let us take your photograph, and yet you let all these people take your picture and put you on TV, and they should appreciate that." ONLY for Michaela would I do this. Only for the hope of finding Michaela. Only for the purpose of keeping her alive by keeping her alive in people's hearts. Only in the hope of perhaps doing some good in the world in her honor, so that what she has suffered might not be for nothing. And what rewards might it reap? A couple of weeks ago, Michaela's photograph was on the front cover of People magazine. It wasn't the big picture, but it was there. I was standing in line at the grocery store buying a sandwich for lunch when I saw it, and it made me cry right there. Might Michaela have seen it, standing in line somewhere? Might Michaela watch America's Most Wanted, or Dateline NBC, or Larry King, CNN, Geraldo, the Today Show, Good Morning America, CBS Early Morning, or the local news? Does she read newspapers or magazines, not only in the United States but apparently on every continent in the world based on the responses I have received? But I believe the best outreach is still the internet. For those of you who want to send flyers, let's use the modern day version of flyers. Everybody, please SEND A LINK TO MY WEBSITE TO EVERYONE YOU KNOW, and ask them to send it to everyone they know, and in short order it will have gone around the world! That link is http://www.missingmichaela.com/ . This website IS Michaela's flyer!!! Or, if Michaela is not on this earth and cannot see the internet herself, others can see it. Those who know what happened to my daughter can go to my webpage, can go to my blogs, they can see my heartache and suffering poured out into these webpages. They can be drawn back to it over and over, day after day, because I know they must be haunted by the knowledge they carry, and perhaps, please God, they will be motivated to come forward with the information we need to solve this case. For them, too, I have made it easy. I've given e-mail addresses, and I've given a post office box, voicemail numbers for me personally, where they can call and leave anonymous tips. I've given phone numbers and e-mail addresses for the investigators, and as Inspector Lampkin has said, these leads can be left anonymously. He does not have some magic access on his phone that provides a trace to incoming calls. So as I said, I know that all the people writing to me and telling me how to find Michaela just want to help, but when I get these messages from people who seem to think I'm not doing what I should be doing to find Michaela, it is a little upsetting I will admit. There are many people who are working to exhaustion to find Michaela, and believe me, if it CAN be done, if it has any possibility of helping the case, it HAS been done or is being done. We've been working at this for almost 21 years now, and we WILL NOT STOP. Sharon, you are an amazing, caring, truly wonderful person. I cry each time I read your blogs - the depth of your love, pain and perseverance moves me so much. You have reached out to the hearts of so many people - we know Michaela and love her through you. I hope and pray with all my heart that Michaela can be in your arms again. God can work the miracles and I believe with my heart that He will do so and bring Michaela home to you. I linked your site to my blog a week or two ago. I hope this helps get the word out about Michaela. I hope other blogs do follow. I think about you and your family daily. Wow! I'm emotionally drained after reading that...I couldn't imagine how drained you were after writing it! And how draining the last almost 21 years have been for you and your family. It's easy for some people to think they have all the answers or how they have the "right" way or a better way to accomplish something, but shame on anyone who ever tries to make you feel like you've "missed the boat" throughout the investigation. And I totally agree with you regarding the age progression photo. 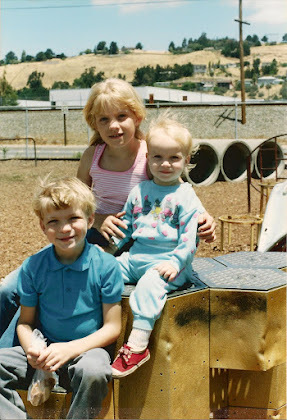 I'm sure Michaela saw lots and lots of pictures of her as a child all around your home, and if she were, today, to come across old photos of herself, she would recognize them instantly. But someone's ideas on paper of how she might have aged over the last 21 years, she might not pay much attention or recognize that person. This website is by far the best flyer you could ever come up with! I live in Arkansas, and I've wondered lately if Michaela could have possibly wound up here by chance. But by forwarding your web address to all my friends in this state, and others in their states, you're right! We could have her story and photo and contact information spread all over! Until Jaycee was found, I must say I didn't even know she was missing all this time. I don't remember seeing her photos anywhere, but now I know her face and her story. I pray for you daily. I pray that Michaela will come home to you. I also pray that if she can't, you will have all the answers you need to be able to move forward with your life. I will also pray she remembers who she is and that she will have internet access and perhaps google her name, her real name, and find her mother anxiously waiting with open arms for her return. Thank you, Sharon! It's amazing how insensitive even well-meaning people can be. As for those age-progression photos, I agree with you 100%. I mean, look at the two age-progression photos done of Jaycee Dugard. They look like two completely different people! Not very useful. I do want to say again that I know that those people who have been writing with their suggestions have only the very best of intentions. I know they only want to help. I just want to make sure they and everyone knows that those involved in the search for Michaela are not leaving any stones unturned. I really do appreciate the fact that they care enough to take time to write to me. Your words are so powerful! I cannot even imagine all the pain and anguish that you have had to endure over the past 21 years. I get teary eyed just thinking about it. I read your blogs daily, and your faith is so inspiring to me. I keep you and Michaela in my prayers, and I hope that she will come home to you very soon. i pray that sumhow If your daughter is alive,she will find out that she's being looked for..n sumhow just go to the police..
u r in my prayers. If I have ever said anything to you that you thought was offensive or upsetting, please accept my sincere apology. It certainly was not my intention. I think you are a nice woman. I enjoy reading your blog. I look forward to the day when your daughter comes home to you. I know what you mean now. Did you see Jaycee Dugard's latest photo in People? Didn't look a dang thing like the "age enhanced" photo. Not even close. I have posted your webpage to my fcbk page and sent it to over 20 mothers I know here on the west coast of Canada. Julie, we don't have a print flyer that we use to actually search for Michaela. Both Michaela and her kidnapper have undoubtedly changed a great deal in appearance in the last twenty years, and I don't put much stock in age progressions. What I try to get out is the message, to Michaela, to the kidnapper, to someone who may know something, and that requires something more than a piece of paper with photos and statistics on it. For that reasons, I try to get out the website, and have people circulate that to everyone. I did have a flyer that I made up last year for the 20th anniversary of Michaela's kidnapping. It was more a "Still Missing ... Forever in Our Hearts" flyer than a plain missing flyer. I don't know if I can upload that here or not, but if you e-mail me I could probably send it to you.